The City of Montebello TAMP is available here. 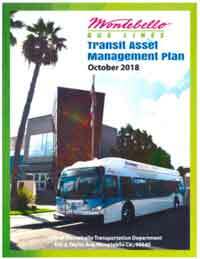 This report is the Transit Asset Management Plan for Montecello Bus Lines (MBL), a Tier II agency located in Montebello, CA. MBL is Los Angeles County's third-largest municipal bus provider (after Long Beach Transit and the Big Blue Bus in Santa Monica). Its fleet is comprised of 39 hybrid gasoline-electric and 27 compressed natural gas buses, and has eight routes that traverse its service area of 26 square miles. MBL serves over 8 million passengers per year throughout the communities of Alhambra, Bell Gardens, Boyle Heights, Commerce, Downtown Los Angeles, East Los Angeles, La Mirada, Montebello, Monterey Park Pico Rivera, Rosemead, South Gate, and Whittier. The asset scope of this document is: Bus, Transit Assets by Mode.